For job-seekers in today’s challenging job market, getting in front of an actual live person to interview for a job with a company is a major goal – second only to receiving and accepting an actual job offer! It seems like more and more these days, companies who are interested in a candidate begin their screening process with a phone interview – usually conducted by an internal company recruiter or an HR person. I’ve already posted a separate blog about phone interviews [“Phone Interviews: Secrets, Tricks and Tips.”] For those candidates lucky enough to pass through the phone interview and graduate to a face-to-face interview … this blog is for you! After coaching and prepping hundreds of candidates for face-to-face interviews over the years, here are some tips, tricks and secrets that I’ve learned that may help. Now I admit that some of this information is identical to my phone interview prep … so, you’ll excuse me if I plagiarize from myself and repeat certain sections from that earlier blog. There are, of course, several very different key aspects to preparing for an in-person interview that are included here. Research the industry, the company and the players. Find out everything you can about the person that will be interviewing you. Try to find a bio on the company’s website. See if there is a bio of your interviewer in the personnel listed on the professional business databases mentioned above. Do a Google Search on their name and see what comes up. Look their name up on LinkedIn and check out their profile there. Figure out if you share any of their 1st degree LinkedIn connections, and if so, reach out to those people and ask if they can give you any insights. Also look them up on Facebook, Twitter and any other Social Media sites you can find to see if they have any public profiles. Take note of things like prior places they’ve worked, where they went to school, hobbies and interests, etc. The more you can learn about your interviewer, the better prepared you’ll be to connect on a personal level. Think of ways to use this information as part of the “Nuggets” technique listed below. (And by the way … your interviewer might be doing those same exact Social Media searches on you — so don’t be surprised if they mention things they’ve learned about you from those same sources!) Just be careful during the interview to not to let the conversation drift too far away from professional topics and into either offering up too much personal information or discussing potentially controversial subjects. For example: politics, religion, sexual orientation … those might be great topics for a first date — but not a job interview! Study the job description and prepare stories. Carefully think through each element of the job description (assuming you have one) for the position you are interviewing for beforehand and prepare concrete examples of when, where and how you have done all the specific things described in that job description. Telling stories is a very powerful interview technique. Prepare brief stories about your past accomplishments and experiences that illustrate how you provided value to your past employers … and by inference, how you would bring similar value to a new company. Be ready to tell your stories and demonstrate with details how you fit each and every requirement they listed. Try to work those stories into your conversation in a natural way during your interview. Print out and bring a few copies of your résumé with you. Most likely, your interviewer will already have a copy in front of them … but sometimes they don’t. If not, it’s always helpful to ask if they’d like to have a copy to refer to – which you just happen to have ready to hand them. You might also be introduced to other people who will want to interview you, and who may not be prepared with a copy of your résumé. It’s best to have them handy. I would advise everyone to dress up for every interview (jacket & tie or a suit for men, conservative business suit for women, no flashy jewelry … and absolutely NO perfume or cologne!) Pay attention to grooming and personal hygiene (hair, nails, breath, etc.) Unless your interviewer specifically instructs you to dress casually for an interview — meaning THEY brought it up in advance … not that you asked if it would be OK — dressing up is the accepted rule of thumb. Sure, lots of places are “Business Casual” these days. I’ve seen interviewers dressed in jeans. However, don’t ever assume that means YOU can dress down for an interview. I’ve had more than one casually dressed decision-maker tell me that they thought a candidate showed a lack of respect by not dressing up for their interview. The bottom line is that dressing up cannot possibly hurt you! Be on time – not too early, and NEVER late! Make sure you know exactly where you are going. Verify the exact address and location that you are to meet your interviewer. Use Google Maps to plan your route. If you have one, use a GPS in your car to avoid getting lost. Do a practice driving run if you are unsure of the location. NEVER be late! But, also do not show up more than 5-10 minutes early. (That is disrespectful to the interviewer, and actually shows desperation.) If you do arrive too early, sit in your car and re-read the job description and gather your thoughts. Don’t go in until it’s close to your appointment time. On the other hand, if you do find yourself running late due to unexpected circumstances (severe weather, traffic problems, etc.) make sure you have a phone number with you that you can call to alert your interviewer about your delay. Nothing is worse than showing up late without having called. And then remember to silence your cell phone before you walk in the door! It may sound obvious, but how you shake hands says volumes about your personality. Practice on someone you trust if needed. You want it to be firm, but not so tight that it feels like you are trying to break bones! The worst is the “fish” handshake – a completely limp hand. That’s just creepy! Almost as bad is gripping someone around their fingers instead of fully locking hands at the base of the thumb. This may sound overly picky, but you’d be surprised how much your handshake contributes to that all-important first impression. Remember to speak clearly, and try to convey enthusiasm and energy through your tone of voice. Smiling helps (really, it does!) Smile as much as possible during the conversation. Try it … you’ll notice that you actually sound very different when you talk through a smile. Pay attention to your posture. Sit up straight in your chair. Do not slouch or lean back. From time to time, a good trick is to lean forward towards the interviewer. When speaking, leaning forward transmits the message that you want to emphasize your point. When listening, leaning forward transmits the message that you are fully engaged in active listening. Also, don’t chew gum! Mirroring the vocal cadence and body language of the interviewer. A trick often used by sales people is to listen to the speed and tone of the interviewer’s voice, and try to match it with your own. I don’t mean imitate the person’s voice or accent … but simply talk slower or faster to match the way the other person sounds, and mirror their general tone and level. Mirroring the general body language of your interviewer (which way they’re leaning, crossing their legs, tilting their head, and other broad gestures) has the same effect. Doing this subconsciously makes the other person feel more comfortable with you, and helps you form a connection with them. Use the “Nuggets” technique to establish rapport. Projecting a Positive Attitude is a critical key. Be a good listener, and never interrupt. Any good interview is a 2-way exchange of information. Let the interviewer talk and lead the discussion without interrupting. Listen carefully, and then give thoughtful answers. Answer questions directly and completely, but try not to go off on tangents or “over-talk” your answers. It’s better to give a brief answer, and then ask “is that what you wanted, or should I give you more details?” Candidates often get nervous and talk too much during interviews, trying way too hard to “sell themselves.” While talking, pay attention to the body language of your interviewer and watch for signs of boredom – fidgeting, looking at their watch, etc. – and cut yourself off if you see them. I can’t tell you how many times I’ve debriefed interviewers who complained about candidates who talked on and on and on during interviews, without letting the interviewer get a word in edgewise! Sometimes it’s better to simply shut up and listen!!! Don’t bring up salary or benefits … but be prepared to answer the Dreaded Salary Question directly if asked. Prepare a list of questions you can ask. At the end of the interview, clarify the next steps. If you are interested in this job, make sure to say so! (“I just want to let you know that I am very interested in this opportunity, and hope we can move forward. What is the next step?”) Don’t leave without determining what the expectations are for the next steps, and how and when YOU should follow-up. Ask what their timetable is for hiring, and how their hiring process works. Also make sure you get a business card with the email address and phone number of your interviewer, and send them a thank-you email that same day. If you met with more than one person, get everyone’s cards and do the same with them. Then immediately make a note on your calendar of when your pro-active follow-up call will be if you don’t hear back from them first. If you really want this job, don’t just sit back wait for them to make the next move. You have to go after it! Entry filed under: Advice for Job Seekers. 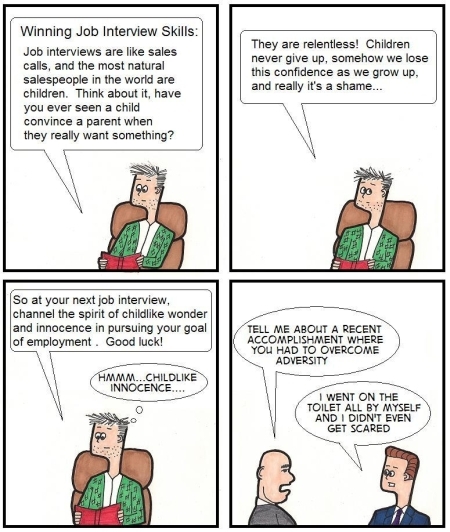 Tags: follow-up, interviewing, job-seekers, salary. Another great article, and timely too! As recently downsized salesperson, I am just now beginning the interviewing process, and there were some great takeaways from your piece. I especially like the “Nuggets”, and recently used it get past a phone interview with the HR person. She listed running as her passion, and I used the recent nice weather to talk about how great it has been to get out and to do some trail runs. She opened up immediately, and it was very easy for me to get to the next step of face to face with the director of sales at her company. Thank you for sharing this. I particularly had to laugh with your recruitment horror stories! The key to a successful interview is being prepared, and having a degree of common sense! I will definitely continue to follow your blog. Excellent tips and tricks. Definitely a must read for someone looking for a job. I found I did a lot of these things indirectly, however following these guidelines will definitely give you a leg up on the competition. Excellent article. You covered all important aspects and provided real-life examples. I highly recommend bookmarking this article for reference. As always, great article. Question on the “dreaded salary question”. I would love to ask right away to see if the opportunity is worth pursuing. The last thing I (or the company) want to do is go through multiple interviews just to find out the position doesn’t pay enough. Can you suggest a tactful way to open the salary discussion very early in the process? Also, Is it likely that the employer would question a candidate’s decisiveness and courage by waiting for the employer to bring up compensation? We all know it’s the number 1 question, or at least very close to number 1. Thanks. You pose an interesting question. Most employers and HR people know that candidates are advised to not bring up salary until asked … so I doubt that anyone would “question your decisiveness and courage” if you waited until they bring it up. Asking about salary before they’ve had a chance to fully evaluate you might compromise your bargaining power. You’ll be in a much strong position AFTER they decide they like you enough to actually make you an offer! On the other hand, if you have some reason to suspect that their salary range may not even meet your minimum needs – and you are not willing to go through multiple interviews before finding that out – then it may not be a bad idea to be proactive and simply ask! You could say something like: “I know I’m not supposed to bring up the issue of salary too early in this process, but I also want to make sure we are at least on the same page so that I don’t waste your valuable time. Can you give me an idea of the salary range that you have budgeted for this position?” Then just wait for an answer! If they turn it around and ask you what you are looking for before they answer, then simply give them your range and ask: “Does that range match what you had in mind for this position?” You will most likely get a straight answer either way. Great information, Michael! Thanks for the helpful tips and tricks. Very informative and insightful article. A lot of common sense, but it goes over everything and is a complete guide to some of those things you may forget! I plan to use this as I prepare for my next interview. Thank you Michael. I think your blog is full of helpful information. I will utilize it and pass it along to others who are also looking for a new position. Can you please elaborate the points about what are the questions that we can ask. Apart from that all the other points were really helping. Thanx..
Saurab: Thanks for your comment on my blog. After reading your question, I wrote a new blog article expanding on that area: “So, Do You Have Any Questions?” Nailing the Interview Closer. You’ve inspired me! Thanks. It’s a great article and very helpful. I am just wondering if it is ok or acceptable to negotiate salary for temp position. The $ amount was given even before the interview. If, as you said, the temp contract’s hourly pay rate was already given to you in advance … then it might be OK to discuss it during an interview. However, who you discuss it with depends on who you’d be employed by. If it’s an agency (who would then place you at a client site) then you should only discuss your pay rate with the agency’s recruiter and absolutely not with the client company’s interviewer. If, on the other hand, you would be working directly for a client company (with no agency or other middle man involved) then discussing your pay rate with the company’s interviewer might be OK. Thank you Michael! I am still reading your blogs – how many hours now…. Very helpful website, great work! Yesterday, one job seeker in CVJS brought in a very valuable question, what if the interviewer did not pass cards after the interview? How do you send them a thank you email ? It happened to me in PepsiCo and after asking for it, the interviewers did not give me their cards but I got follow up interviews. If the interviewer does not have a business card with them, then simply ask for (and write down) their email address before you leave. Alternatively, you can call the company’s main number afterwards and explain that you just met with so-and-so, and want to follow up with an email. Most places will then give you that person’s email address over the phone. One question that always gets me: Where do you see yourself in 5 years? That’s a tough one, I have yet to master! Of course is OK to state your salary expectations to someone who is offering you a position. That applies to both temp and perm jobs. The key is to wait until you are actually being offered the position and are at the negotiation stage. Don’t jump the gun and talk about salary during the pre-offer interview stages — unless, of course, the interviewer brings it up first. Whether or not the $ amount was given before the interview, it is certainly acceptable to ask for what you want … especially if the amount they stated is below what you consider acceptable. Once you have what you think is a “final offer” — then it’s up to you to decide if it’s something you can accept or not. The bottom line is that if you don’t ask, you don’t get! You wrote a great article- I followed the steps in your article as they applied to the role I was interviewing for. I had a phone interview and was told that I was a the top candidate. I was called in for a face to face and was told that the company liked me but wanted to complete the interview process. They will let me know their decision in about a week. Nice tips. I like it the way you have discussed in small small steps easy to comprehend. Congratulations.